West Worcestershire MP Harriett Baldwin was taken on a tour of a brand new building at Malvern Science Park which will allow local businesses to expand. The MP was shown around the new block at the science park by chief executive Alan White, who is now looking for companies to move into the new space. The building is the latest part of plans to expand the science park and offer state-of-the-art office space for companies working in the science and technology arena. Harriett said: “The science park has been on a great path of expansion over the last few years. I have had my constituency office here since I was first elected in 2010 so I have watched at first hand companies, start-up, grow and expand into larger and larger offices. “Malvern Hills Science Park has been a real success story for our local economy and there are further ambitious plans to develop space for companies to grow. “The brilliant brains of Malvern continue to drive innovation nationally and internationally and the current focus on 5G technologies puts the town at the cutting edge of invention. 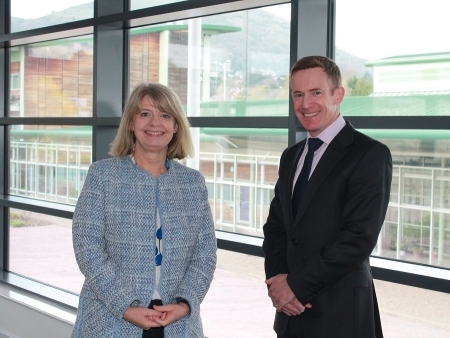 Photo: Harriett Baldwin MP is given a tour of the brand new building with Malvern Hills Science Park chief executive Alan White.